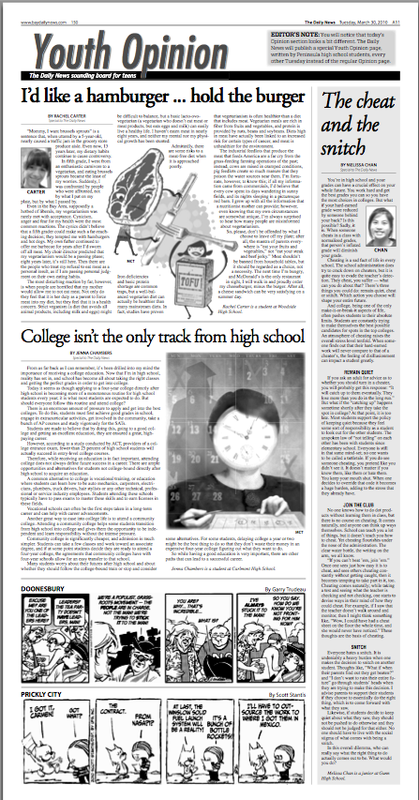 The Daily News has started a Youth Opinion page featuring columns from students at mid-Peninsula high schools. Editor Mario Dianda says the students can write about pretty much whatever’s on their minds. “It’s a chance for them to get published while sharing their views and perspectives not only with their peers but also with our older readers. For us it’s a chance to get some younger perspectives in our op-ed pages and to try to connect with a generation that most pundits say gets the bulk of its news from online social networking instead of newspapers,” Dianda tells the Press Club in an e-mail. He says the Daily News has lined up about 30 students who have committed to contributing columns. On April 13, for example, there’ll be a column on how school districts need to do a better job of incorporating online lessons into their teaching curriculums and another on how Gunn High School sports don’t get their due. The new page appears every other Tuesday in the Daily News. At left is the March 30th edition of the Youth Opinion page.